Facial scars are very common from injuries or surgical procedures. If you call your average cosmetic surgeon and tell them that you have a recent scar, the chances are they will tell you that there is nothing that can be done for a year after the injury. Unfortunately, this is frequently misinformation. 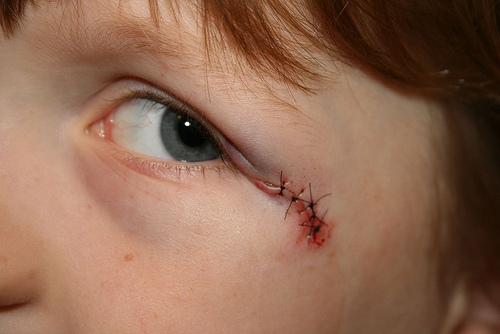 There is evidence that by treating a scar early, the outcome of the result can be improved. Some studies have shown that when a scar is treated within 8 weeks of the injury or surgery that it can heal much better than waiting an extended time. I have adopted this method of treating traumatic and surgical scars of the head and neck and it has worked well. When a patient presents with a scar of the head or neck that is less than 8 weeks old, I will begin treatment with various modalities including steroid injection, silicone sheeting and pressure. When the scar reaches its point of primary healing then I will most commonly treat it with the CO2 laser. The laser performs several functions to improve the scar. Number one, it allows uneven tissue margins to be blended or smoothed down. Number two, it causes new collagen to be produced to fill in the irregularities and number three it helps blend the coloration with surrounding tissues. Lasering the scar is usually done under local anesthesia and takes only a few minutes. The area will be raw for the first 5-6 days and then be a smooth pink. This pinkness will fade over the ensuing weeks but may last several months in some cases. The above scar was treated with CO2 laser resurfacing about 6 weeks after the injury. 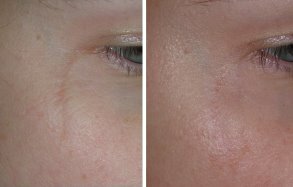 This was an exceptional result and not all scars of this type respond to such an extent from a single treatment, but this case shows the power of the CO2 laser for scar treatment. The above patient sustained this scar from a surgical procedure at another office. 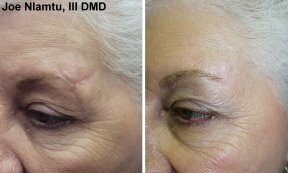 Dr. Niamtu treated the scar with two sessions of CO2 laser resurfacing. Sometimes the scar is lasered multiple times as it improves with each treatment. While simple lasering may work great for simple scars, more complex scars may need surgical intervention first. Many surgical procedures exist to make scars less noticeable by changing the direction of the scar, making it it more random (straight line scars stand out more) or making the margins even. Sometimes Dr. Niamtu will perform a surgical scar revision and then follow up with laser resurfacing to better blend the scar. Some depressed scars (those that are like craters) respond will to filler injection. By injecting silicone or other fillers, many depressed scars can be simply “popped out” by filling the base of the depression with filler. This is useful in acne or pock scars. Subcision is another useful technique. Subcision is a process in which a special needle is used to break up scar tissue at the base of a depressed scar. A depressed scar has spider web like bands called adhesions that, in part, are what keep the depressed scar tethered down. By inserting this cutting needle under the scar and swiping it back and forth, these adhesions can be separated and allow the base of the depressed scar to rise up and fill in. Subcision can be performed multiple times to improve a depressed scar. This patient sustained a severe facial scar from a motorcycle accident. This scar required surgical treatment followed by laser resurfacing and silicone injection.